Generating traffic is no small thing. For many website owners starting out, the excitement comes in getting the site launched. But for anyone who’s been around the block when it comes to building or running a website, the real excitement is getting traffic coming in large numbers. Everyone who’s ever run a site will tell you that generating traffic is a job in itself but thanks to the many tools and platforms available, getting traffic has become easier if you know how to apply the basics which you will learn from this course. Complimenting the Traffic Generation 2018 Made Easy ebook, you will learn about how to really get your site pulling traffic. You’ll discover the on-site optimization methods involved, the power of social media, and getting a really great return on your investment both with your time and efforts and with your campaigns. For many lazy, people it’s always easier to hire an agency to do the grunt work but it can be costly and often times not as effective as you’d initially thought. It’s not like trying to dig for gold and hoping to get lucky. Everything that works today is covered in this course. All methods are very doable and with your efforts, you’ll be opening the floodgates to a ton of traffic once you apply the principles. With 20 HD videos of pure practical information covering every nook and cranny, you’ll be ready to rocket to the top spot and have traffic pouring through in no time. 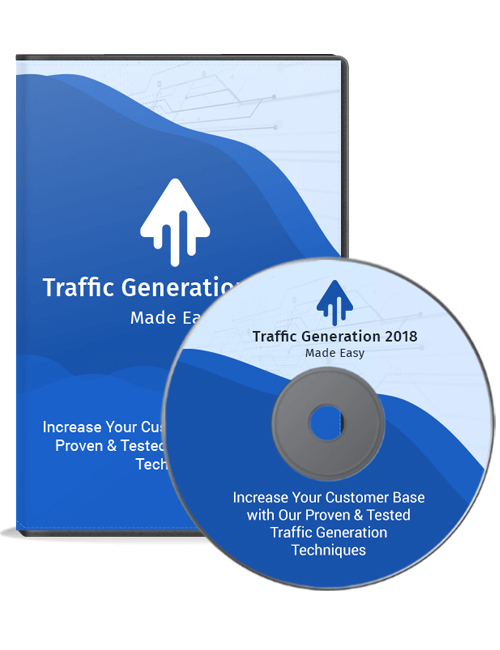 You can also get the Traffic Generation 2018 Made Easy ebook version with this video course. Hit the download button now.